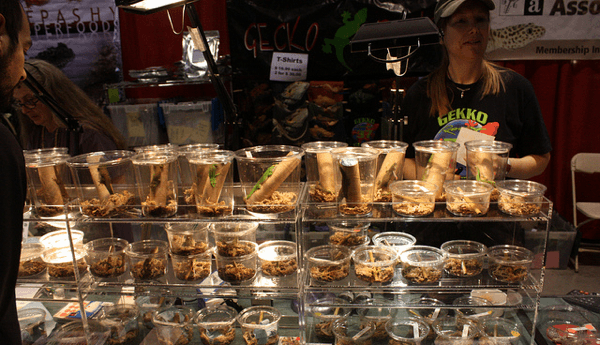 A few years ago, I wrote an article for Gecko Time called “How to Vend at Your First Reptile Show”. It occurs to me that a similar article for people attending a first reptile show would be useful as well. People attend reptile shows for a variety of reasons. Some are simply curious about the animals they may see at a show and come to “window shop”. Others are looking for specific reptiles or supplies, or may attend without knowing exactly what they’ll go home with, using the “I’ll know it when I see it” approach. The larger reptile shows are overwhelming with hundreds of vendors. What follows are some hints for people who plan to attend a reptile show in order to buy something. “Homework” can be done in two areas: preparing for the reptile you hope to purchase and preparing for what you will find at the show. 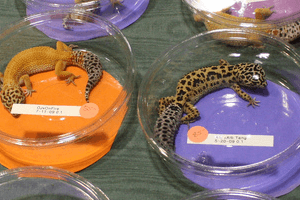 Preparing for the reptile: It’s best to choose the type(s) of reptile you hope to buy before you get to the show. If this is a new species for you, read caresheets so you have a good understanding of what you’re getting into. Either prepare the enclosure with everything you need before going to the show, or plan to purchase the set-up at the show. If you plan to buy the set-up at the show, have a complete checklist of what you need so you don’t forget something crucial that will reduce the reptile’s comfort when you return home. If you’re not sure what kind of reptile you want, make a list of some of the possibilities. Evaluate your home situation in terms of how large an enclosure you can have in your home, what kind of reptile food you’re willing to deal with, what kind of heat and light you can provide and how much care you have time for. Be aware of which reptiles are illegal to own in your state, especially if you’re going to a show in another state. For example, there are many vendors of chameleons at the show I attend in New Hampshire, but it is illegal to own a chameleon in Massachusetts, where I live, without a permit. Preparing for the show: The more information about the show that is provided online, the more you can prepare. Most shows have websites publicizing them and many have lists of who will be vending at the show, often with a link to the vendor’s website. If there’s no website listed, you can often find a facebook page or website by googling the vendor’s name or the business name. 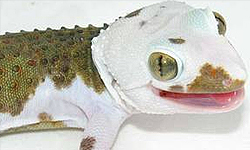 Looking at vendors’ websites will help you locate vendors who are selling the reptiles you’re looking for and also can give you a preview of specific animals that they have for sale. If you do this early enough, you could even contact the breeder with questions about their stock or the reptiles on their website. As a vendor, I can tell you that I love knowing that someone is interested enough in my geckos to contact me in advance and plan to visit my table. Write down all the information you gather; you will not remember it once you get to the show. Arriving at the show, you will likely enter a large convention-hall type of room with anywhere from 25 to 200 tables. It’s noisy and overwhelming. If you try to look at everything in detail, you are likely to run out of steam early on. You should have a notebook with you, listing the supplies and animals you hope to purchase. Take your first pass through the show by walking through all the aisles and looking at each table for the items you need. It’s best not to stop at tables that have things you’re not interested in buying. If you’re looking for a gecko, skip the snake tables. Whenever you see an item you plan to buy, write down the location of the table and the price of the item. If you see a reptile you’re interested in, write down details about it including morph, size and price. Don’t be afraid to speak to the vendor and ask questions about the reptile in question (see below: Making a Good Purchase). If you’re very interested in a particular animal, see if the vendor would agree to put it aside for half an hour. It is good etiquette to return to the table and let the vendor know that you’re not interested if that’s the case, even though he or she would put it back out on display after the specified time passes. It’s not unusual to find widely differing prices for the same items at different booths. Once you’ve gone through the show and made your notes, circle the places that have the best price for each item. If it turns out that the best deals on most items are with the same vendor, you may be able to talk him or her into matching the lower prices of the other items that you’ve documented. It also may happen that you’ll have to go from table to table picking out the best prices based on the information you’ve written down. Some vendors accept credit cards but many don’t. Be sure to bring adequate cash by estimating how much you will need to spend to get what you want. The most difficult part of attending a show can be locating and choosing the reptile you’re going to buy. Obviously, you’ll be following guidelines to choose an animal that seems to be healthy. You should know what to look for in a healthy animal before show day. In my opinion, there are two types of vendors to avoid, besides those whose animals are clearly poorly cared for and unhealthy looking. Avoid vendors with many very young reptiles crowded together and selling for a very low price. I have often seen vendors with a small tank of 15-20 tiny baby leopard geckos, selling for $10 each. What you see is what you get. While it’s possible to have a good experience with such an animal, in many cases these babies are really too young to be sold, may not be well-started, and may be over stressed from the crowding. Also, avoid vendors who have only 1 or 2 specimens of the species you’re looking for and a great variety of other reptiles. Once again, this doesn’t have to be a deal-breaker, but frequently, the vendor has only a few of the species you’re looking for because he or she got it in trade, is now trying to move it on, and doesn’t know much about the reptile in question. An exception, of course, would be the case of a relatively rare reptile where the vendor has produced only a few specimens. 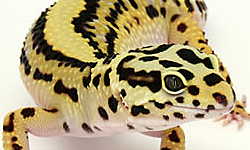 While it’s not essential, look for vendors who have produced the reptiles they’re selling. If you’re looking for breeding stock, be sure the vendor can supply the animal’s complete genetic history. If the vendor can’t answer your basic and reasonable questions, don’t buy from him or her. I recommend that you don’t give in to the temptation to choose your reptile before going through the whole show. It’s possible that you may find exactly what you’re looking for at the first table you see and snap it up because you’re worried that someone else may buy it. On the other hand, at my last show, I had numerous people come up to me carrying a gecko they’d just bought and regretting that they’d made their purchase before checking out my table since they found that I had something nicer or less expensive than what they’d bought. For every reptile you’re considering, write down the table location, price, description of the reptile and notes about what you like about it. After you’ve gone through the entire show, take some time to look at your notes. If you’ve asked a vendor to put a reptile on hold and you’ve decided against buying it, go back and let the vendor know. If you can’t decide among some of your choices, go back and look at each one. Talk to the vendors. See if they’ll give you a break on the price, especially as the show nears its end, but don’t make ridiculous offers (e.g. offering $20 for a $200 gecko). Sometimes the impression the vendor makes or the deal the vendor is willing to do is the deciding factor. Be sure to get the vendor’s contact information in case you have questions or problems later. Ideally the vendor will have the reptile’s genetic information written on the container or on a separate piece of paper. If not, ask for the information and write it down. If the vendor can’t or won’t provide it, consider going somewhere else. Above all, if you don’t know how to care for a particular reptile, don’t buy it. If you have an impulse to purchase something you weren’t planning to get, that can be fine as long as you can get proper care information and purchase any supplies for it that you don’t already have. Lately there have been a number of stories of people buying a new reptile and having it die before it even gets home. For best results, don’t open the container until you get home. The last thing you want to have happen is to lose your new reptile at the show, in the parking lot or in the car. Be aware of the heat differential between the show and the car. Be prepared to put on the heat or the air conditioning (depending on which way the differential is going) in advance if necessary. Don’t stop for dinner or to do errands on the way home and leave the reptile in the car. Cars get very cold or hot quickly depending on the season. If for some reason the reptile dies before, or soon after you get home, take a picture and contact the vendor immediately. 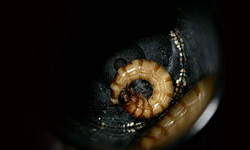 Be prepared to provide detailed information about the conditions under which you transported the reptile between the show and home, and the set-up you provided for it. Attending a reptile show should be a rewarding and exciting experience. If you buy a reptile, you should have positive associations with the show for years to come. Following the guidelines above should help to make this truly a wonderful experience. Photos are property of Ron Wiebe licensed through Creative Commons. Photo 1: lead photo, Photo 2: article photo. What an insightful article. Perhaps the only thing I would add is to get there early so that the vendors are not overwhelmed by the masses and one is able to talk leisurely to vendors and assess their stock judiciously. I wish I had this article prior to my first adventure to the show. Thanks for the awesome article! I’ve been to various shows before, but I’ll be using your tips when I go to purchase my first crested geckos at my next show! I wish I could tell you, but that article was written a year and a half ago and I don’t even know now where the picture came from. You best bet is to google “reptile display cases” and see if you find something like that. Thank you for writing this article, it was very insightful! I’m going to my first reptile show in a few weeks and planning on getting a sunglow red tail boa. I am very excited. I’ll be sure to take notes on tables and prices! Great advice. Glad this was helpful. Good luck with your planned purchase.